What makes a wine a winning partner for warm-weather foods? We tasted our way through four different answers to that $64,000 question at Friday's summer wine dinner at Cooking with Class. Choosing lower-alcohol wines is one way to keep summer heat in check. These wines don't feel as hot in the mouth as high-octane wines, a sensation you might enjoy by the fire in winter but not so much on a hot desert night. Stay cool with wines that clock in under 13 percent. If you have trouble finding lower-alcohol wines in your wine shop's domestic section, venture over to the Loire, northern Italy and Germany for more choices in the 11 to 12.5% range. The fresher flavors and lighter weight of summer foods can make wines with overt oakiness seem heavy or clunky. While the toasty flavors imparted by oak can play up to the smoky flavors of barbecue and outdoor grilling, all that wood can clobber the palate. Instead, try lighter-oaked styles or blends with neutral-oak aged or unoaked lots in the mix. If you can't find clues to a wine's oak ageing on the label, ask your wine merchant. More Chardonnay producers are trumpeting their no-oak or less-oaked wines with label terms such as oak-free, unoaked, naked, virgin or references to steel or metal. Whites that are often unoaked include dry Muscat, Torrontés, Riesling, Albariño and most Sauvignon Blanc from New Zealand. Summer is a perfect time to sample the un-chardonnays of the white wine world. Lighter sauces and breezier preparations call out for wines with bright acidity, fresh fruit flavors, delicate or floral aromas and a solid core of minerality. White wines from cooler climates deliver the goods. Look again to the Loire Valley of France for whites that seem made for summer salads, shellfish and lighter meats, as in Muscadet, Chenin Blanc and Sauvignon Blanc. Gotta have red? Loire Cabernet Franc is a versatile match for picnic and warm-weather foods, including herbed vegetables and white meats, salmon and grilled ahi. Soave from the Veneto region of northeastern Italy has made giant leaps in quality since it unleashed oceans of watery, thin wines last century. Labels that bear a classico designation on the label are good bets for elegance, lemony and mineral flavors, smooth texture and hint of almond on a clean finish. Further south, sharper Vermentino from Sardegna is a lip-smacking tart white that cries out for seafood and acid-based dressings. Stateside, the cool northwest is producing whites that are big on value and flavor. Oregon Pinot Gris has just the right amount of weight and citrusy verve to pair well with summer vegetables, appetizers, fish, poultry and lighter meat dishes. Venture into Washington wines too – their Rieslings are getting better and better. So what did we serve Friday? We began with Guy Saget Les Clissages d’Or 2009 Muscadet de Sèvre et Maine, a 100% Melon de Bourgogne lovely from the Loire. 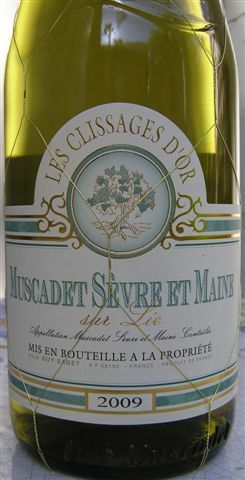 Aged on its lees for a lush, creamy texture, this Muscadet offers food-friendly refreshment with a salty tang. Adorned in les clissages d'or, the handwoven gold threading on the bottle, it was also the prettiest bottle of the night. For the second course, the nod went to Italy's Veneto and the Filippi 2008 Soave made from 100% Garganega. Its lemony freshness and medium body made it a lively pairing for Chef Andie's version of shrimp scampi with creamy polenta. Next up, we'll tell you about warm-weather reds and the two that brought our summer wine dinner to a grand finale – one by a single-minded California newcomer and the other a surprising debut from southern France by a storied winemaker . Tell us what you think - no profanity or product pitches please.